The College Basketball Closer is written by the gang at Storming The Floor. You know I write for a site called Storming the Floor. That's because I believe that floor storming, when done at the right time and in the right spirit, is one of the things that makes college basketball so damned fun. When legitimate exuberance spills over after a big win, it's magical. Of course, sometimes, it all comes off a bit... forced. And that's when the storm has been used for evil instead of good. One such potential crisis was averted last night, when surging Purdue knocked off Michigan State for their second big win in three days. 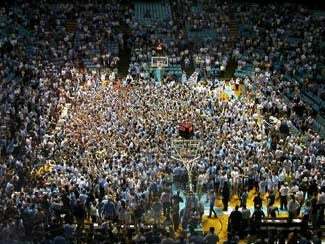 Students had filled the hardwood in the first win, over Wisconsin, but showed admirable restraint following their second major victory. They somehow absorbed the cardinal rule - once is charming, twice is crass. • Your team breaks a long losing streak vs. a particularly difficult opponent. (See: Kansas State vs. Kansas). Hummell is Unbreakable. Purdue 60-Michigan State 54. Tom Izzo's one of the more enjoyable college coaches around, and he'll do all right in the dance. But for now, the Big Ten is all Purdue. Boilermaker freshman Robbie Hummell doesn't have the most intimidating moniker I've ever heard, but he sure can play - he put up 21 points to help beat the Badgers, and upped that to 24 with 11 rebounds for good measure in the win over the Spartans. Foster is Australian for Beeah. Vanderbilt 93-Kentucky 52. Is it fair that this result makes the Kentucky "comeback" look like a fraud? Probably not, but a 41-point spread is tough to argue with. Aussie freshman Andrew Ogilvy had his best all-around game since SEC play began, scoring 19 and rebounding 12. Shan Foster went for 20. Notre Dame (18-4) at UConn (18-5). Neither team was ranked when the Irish pulled out a six-point win in South Bend earlier this season. What a difference a handful of days make. Luke Harangody is averaging a double-double, and Hasheem Thabeet is UConn's rising star. Should be a thriller in Hartford's XL Center. Wisconsin (19-4) at Indiana (20-3). Purdue has the momentum right now, but one of these teams will serve notice that they intend to maintain the pace. Which will it be? What, No Love For... Arkansas at Tennessee? Maryland at Duke? Houston at Memphis? Eric Angevine writes about college basketball at Storming the Floor, and contributes to Chicago Sports Weekly. He can be reached at stormingthefloor@gmail.com.